Stair steppers, also known as stair climbers, are machines designed for cardiovascular exercise as well as whole-body aerobics with an emphasis on the lower body. Most modern stair steppers include levers which move in concert with the pedals, which provides for upper body exercise as well. Stair steppers are valuable calisthenics tools which exercise the user’s mobility, to a greater degree than running alone. These are among the tools used in physical therapy, and they are also excellent for weight loss. 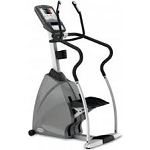 Calibration and adjustment of the exercise machine, as well as repair and replacement. Regular safety checks are crucial for predictable and secure operation of exercise machinery. Provided that the replacement parts are still in production, we are able to obtain them from the manufacturer directly. Worn cables, worn bearings, broken and worn plastic parts, faulty wiring and control boards (if applicable).